Prairie Fire Pie started as a dream for Chef James Shrader. He set out to create what he fondly calls ‘West Coast Inspired’ pizza as experienced in his native home of Seattle: slow fermented pizza dough, topped with a blend of both traditional and unexpected toppings, all fired together in a wood fired pizza oven. It’s a style of pizza that Tulsa hasn’t seen yet and offers an array of flavors unparalleled by traditional deep dish or thin slice renditions. Catch our version of the West Coast as we bring our distinct flavor and a wood fired tradition of cooking to Oklahoma. House Mozzarella, Fire Roasted Tomato, Fresh Basil 13. Pepperoni, Mozzarella, Provolone, Pecorino 14. Meatball, Mozzarella, Provolone, Oregano, Chili Flake 15. House Made Italian Sausage, Hearth Roasted Peppers, Romano 15. Potato & Egg, Mozzarella, Rosemary, Pancetta, Soft Egg, Sea Salt, Arugula 14. Caramelized Fennel, Chard, Shallots, Mozzarella 15. Oregon Mushrooms, Garlic, Thyme, Arugula, Truffle Mozzarella 16. Chicken Carbonara, Bacon, Peas, Romano, Mozzarella 15. Roasted Cauliflower, Mustard, Parsley 8. Clams, Stella, Chilies, Garlic, Herbs, Sourdough 12. Crispy Chicken Wings, Garden Vegetables, Ranch 10. Baked Fontina, Rosemary, Garlic, Thyme, Sourdough, Granny Smith 10. Meatballs, Red Sauce, Romano, Provolone, Sourdough 8. Baby Kale, Preserved Lemon, Pine Nut, Reggiano, Toast 8. Spring Mix, Roasted Garbanzo Beans, Fresh Mozzarella, Cherry Tomato, Pickled Red Onion, Italian Dressing 10. Artisan Board: Country Terrine, American “Prosciutto”, Chicken Liver Pate, Cured Meats, Cheese & Accompaniments 18. Vanilla Bean Panna Cotta, Seasonal Gastrique, Fresh Fruit, Basil 8. Tiramisu Mousse, Espresso Syrup, Crumble 8. PFP Pizza starts with the dough, fermented for a full 48 hours, creating a bubbly crust that is light and perfectly chewy. Our toppings are meticulously sourced to create a blend of traditional favorites, with a few unexpected addtitions. Each pie is then finished in our wood fired pizza oven to give that Prairie Fire flavor that can’t be found anywhere else in Tulsa. PFP’s menu isn’t just pies. 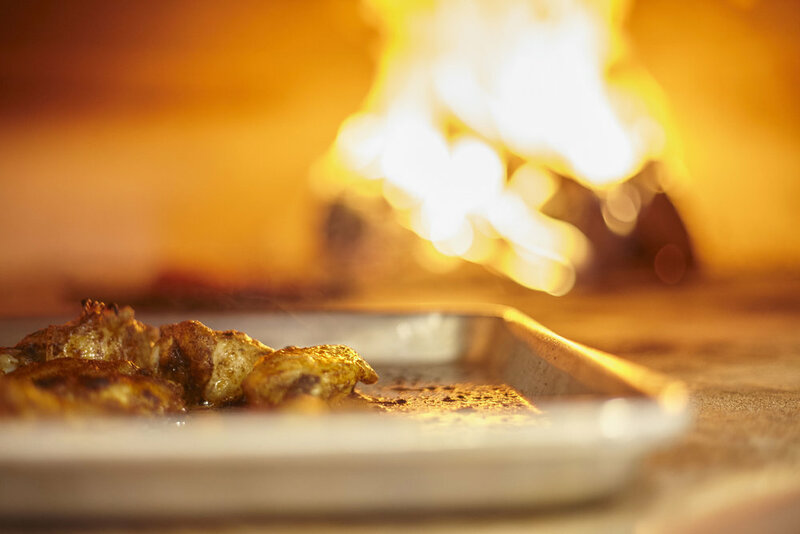 We also feature salads, wings, wood fired vegetables and seasonal specials that might surprise you when cooked to perfection in our wood fired oven. This gives what is seemingly an ordinary menu item extraordinary flavor. The PFP drink menu is curated by our own Luke Constable and offers a selection of West Coast wines, both microbrews and domestic beers on tap, as well as cocktails featuring some unique spirits. Everyone is sure to find an authentic pairing for their wood fired experience.